I started this blog 3 years ago this month. I had no idea what I was doing or where I was going. I learned a lot along the way so here are a few simple blogging tips that I have picked up through trial and error. 1.) Have comments sent to your email. This makes it super easy to respond to your readers comments and questions. Responding to readers is so important. They take the time to read, subscribe and comment so keep those lines of communication open. To do this, go to "settings" "mobile and email" and enter your email address in the box for comment notification email. 2.) Turn off your captcha. If you love comments, turn that darn thing off. It's easy to get rid of spam comments by deleting them as they come in. You won't get hundreds a day or even per month so make it easy for readers to leave some comment love. 3.) Promote your blog posts on your social networks such as facebook, twitter and pinterest. This is a great way to bring traffic and to update those that don't have Google accounts or RSS feed. I read a ton of blogs and sometimes I miss posts in my feed readers so when I see your updates elsewhere, I'm always thankful that I didn't miss out. 4. )Make friends with other bloggers. I have several blogging friends that I don't know what I would do without. Bounce ideas off each other, collaborate on posts, help each other in blog design or anything you can do to support one another. 5.) Post big photos. Not too high resolution or they'll take time to load but post nice big pics so we can see all of the details! 6.) Declutter the side bar from time to time. Avoid too many pointless gadgets and pictures and please ditch that music player all together! Music can be shared on blogs in a post, with a button that a reader can click if they choose to listen to it. A human brain cannot read and listen to music at the same time and still give equal attention to both. 7.) Have a way to contact you If a company wants to sponsor or have you review a product, if a reader wants to say hi or has a question- make sure you have an email address that's easy to find. 8.) Have all of your social networks and other sites match your blog name. Twitter, facebook, pinterest, etsy, etc should all match your blog so your readers can easily connect with you elsewhere. 9.) Comment on other blogs. Show the love and support for other bloggers by leaving comments. It's good for your traffic, good for the community and it brightens someone else's day! 1.) Feed into negative comments or let them get to you. I don't know why people feel the need to act like jerks to total stranger but sometimes they do it. Just delete that crap or move on...or both! I've had plenty of negative comments on here and I'm sure I'll get more. Some of them are just constructive criticism so think about those ones and see what you can improve on. Others aren't worth a second glance. 2.) Obsess over your statistics. Sure, do keep an eye on them to see what people like and get ideas on how to improve your blog but spend that valuable time wisely. 3.) Post without a photo We love pretty pictures! They grab a readers attention and make the blog a stimulating read. Always post at least one visual item to go with your text. 4.) Cry when you lose a follower It happens to all of us. Don't take it personal when your number drops. Some people lose interest in the subject matter, they are too busy for blogs, etc. It rarely has anything to do with the blog author, I promise! 5.) Blog about your job or personal details There's a fine line between being personable and sharing too much information. My rule of thumb is: if I wouldnt mind my little brother, grandmother, boss and mother in law reading it, then I can post it. 7.) Waste too much time with affiliate programs. Affiliate link posts take an eternity to write and rarely yield a lot of profit. If you want to monetize your blog, try selling your own ad space or getting a few legitimate paid posts that your readers would enjoy. This will appear as your blog name only, with a clickable link. 9. )Spend your life on the computer. Spend a few minutes each morning (or evening) with your social networking. Use sites like Hootsuite to set up tweets and facebook updates to post automatically. When you're not on the computer, you can spend time with family, being creative and thinking about your next great post. 10.) Blog if you're not loving it. Some days, we all get in a mood and we just aren't feeling it anymore. 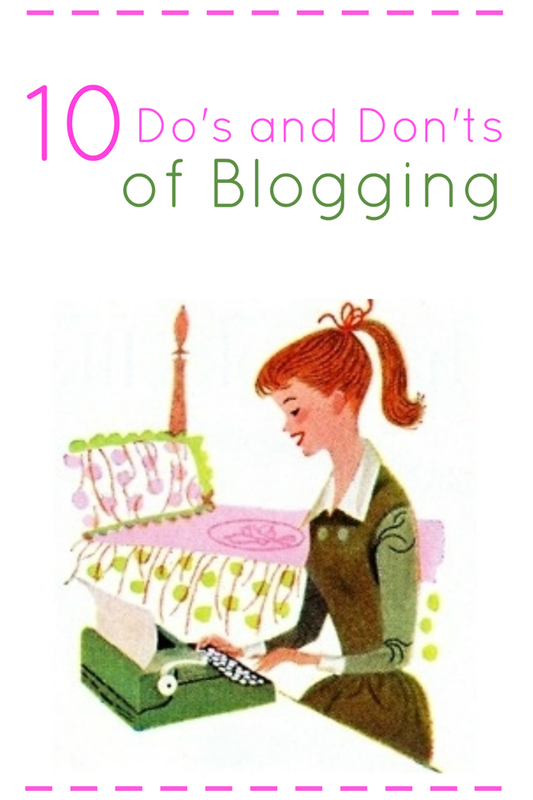 A successful blog is extremely rewarding but only if you're still having fun! If you get in a blogging funk, reassess your blog goals. Think about why you started your blog, what you really want out of it and maybe give it a re-design. It's always okay to take a blog break! Brilliant tips, especially the ones about not taking it to heart when stats are down, and not spending every waking moment on the computer. Good tips,Brittany.And really I can't stress enough the importance of moving on when it comes to negative comments,you're so right.I don't even bother publishing them when I get them.I too get a little "boo" when my followers list or stats goes down too but I have to remember I'm not blogging as much as I want to this year. Great post, ! I have to agree that captcha is really annoying - especially as most of the time it take a few times to get the answer right! I've just switched mine off! Love these tips - especially the auto music. GAH! I have stopped reading many a blog on account of this. Also - thank you for the url how to - I have wanted to do that for a while now - so I am going to try it on this very comment! Ok - giving it another go! This is a great list of tips. I've been feeling a little stuck lately, but now I feel a little less stuck. Thanks! Great tips! I've been blogging for almost a year now but still have days when I feel I have no idea what I'm doing. I always advice bloggers not to write entire "I am sorry for not blogging more frequently"-posts. I feel that it is OK to say "Have been busy, long time since I posted last", but it is no fun reading a long post about how you plan on getting sooo much better, and will start posting every week/day/younameit. And if you then scroll down and see 3 of these "sorry-posts" in a row... well, that's just silly! Post when you want and have something to say. Blogging is not a chore, is it? Love your blog, by the way! If I am feeling a bit bad one day I just go to your blog and look at all the wonderful photos, it always cheers me up! Excellent! Thank you for the tips! Love the post, I have learned a lot from you and have started a great friendship too. Very good point about not having the captcha thingie to prevent spammers. I know many times I can barely read the letters all on top of each other and on my cellphone its impossible, so I've missed making comments, or just say the heck with it. Hopefully my readers will enjoy the free commenting space now. What a great post! And a neat new trick :) Thanks, Brittany! Oh yes! Categories are always so helpful- and at least a post archive! Stellar, helpful advice and blogging common sense. I found myself nodding the whole way through, as I adhere to a very similar set of blogging guidelines myself. Fantastic post, Brittany, thank you for sharing some of the blogging wisdom you've gleaned after three years at with all of us (early happy blogiversary wishes!). Thanks so much for the tips :-) I completely agree about Captcha, it is SO frustrating to try to leave a comment that sometimes I bail. Good tips! I'm always afraid when I see "do & don't" lists, but it turns out I'm not so far off the mark after all. I mostly have trouble with the "make friends with other bloggers" thing. One thing I might add, though, is that the etiquette for sharing the link for your blog differs depending on which community you're in. I overlap with nail polish/beauty product blogs, and most of them are vehemently against any links in their comments at all. When in doubt, look to make sure there isn't a "no links, please" right next to the comment button. really?! Wow, I wonder why that is? I love links because it helps me to find new blogs and stuff!! I'm not totally sure, to be honest! I think there's a lot of the spammy link-dropping, but I also think that vintage bloggers are a lot more encouraging and open... A lot of new beauty blogs are pretty rough around the edges, and I think established bloggers & long-time readers don't want to look at a site until it has enough polish (if you'll pardon the pun) to stand on its own merits? I've seen a lot of FAQs and things where established bloggers feel like people leaving their links in the comments are trying to piggyback on their successes to get attention. Wonderful tips, Brittany. I learned some new blog etiquette! I just wanted to say thanks for this post! I've had a blog for a while but I've never been very consistent with it until recently. It's nice having the pointers before I start taking it more seriously and I feel that this was very well worded! Fantastic tips!! I'm happy that apparently I'm on the right track, for the most part. I especially love all the comments above :-) sometimes it's so easy to feel lonely in the blog world! Share & share alike, you know? Ooohhh!! Really good tips!! I did my first blog post today!! So this will definitely help!!! Also I "met" your friend Bunny!! (well, if you call meeting a Facebook meet lol) I'm a NYer too so I was happy to find her blog and get in touch with her. I've only met her through FB but I can tell she's a sweetie!! Thanks for this post. I'm totally inspired!! Happy New Year! This was SO incredibly helpful!!! I'm not trying to earn money or blogging fame or anything, but I have wondered what the heck I'm doing or not doing to make things more reader friendly. I guilty as charged about having multiple posts that are "sorry I haven't blogged in forever". In reality, I should put a "who am I" sort of thing somewhere that explains that I have five kids under the age of ten and sometimes I'm just too busy to get a blog post out. I love reading you blog, though. I think I came across during pregnancy number four or five when I was searching for vintage maternity or something like that. 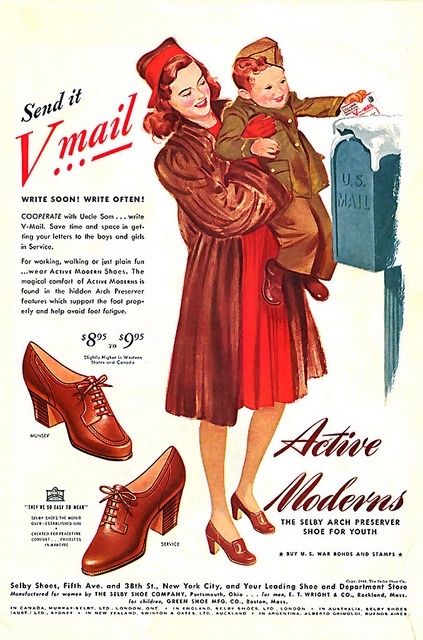 I love the plethora of vintage lifestyle bloggers, but especially when they are other mothers like myself. Okay, now I have to try this. Well, I obviously did something wrong, but I am too embarrassed to try it again. This is a great post and I so agree with you about captcha. It is really annoying,d but I find that many Blogger blogs have this enabled. I had it on at first too when I started blogging and thank goodness a very successful blogger who visited my blog gave me some great advice about turning it OFF. One thing that I would add is for bloggers not make constant posts about how sick they are. Unless you have a particular disease and you are catering to that audience, don't do it. It is one thing to post that you have a cold, but when you are regularly posting about waking up feeling sick and how you have gunk in your eyes that is going too far. I have seen this on one person's blog and it was sickening (pun intended). Every other day she was out of sorts for one reason or another and would go into detail.